The Canon EOS 80D is one of the best DSLRs we’ve seen all year – and now it’s an even better deal, with a brilliant Black Friday camera deal on Walmart that slashes $390 off the price and includes a free accessory pack. 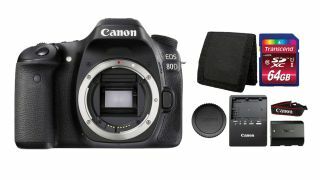 You can currently grab the 24MP Canon EOS 80D bundle for just $806.73, down from $1,199 – a great deal on a great DSLR. The Canon EOS 80D boasts a new 24MP APS-C sensor, which delivers superb image quality – and, because the APS-C format is smaller than ‘full-frame’ DSLRs, it means that the 80D is both lighter and more compact than many other camera bodies. Its fully articulating touchscreen enables you to compose and shoot photographs from any angle, and is perfect for filmmakers looking to create videos and vlogs, particularly with Canon’s much loved Dual Pixel Autofocus that makes it an absolute breeze to get your subjects sharp. We’ve seen some other great Canon Black Friday offers on the EOS 80D, but Walmart is currently the one to beat. Not only is it the best price, but it’s a US model (which means you get a US warranty, unlike international models sold elsewhere) and you also get a free accessory bundle featuring a 64Gb memory card and wallet. In all, a blistering Black Friday deal.